Every sizable property owner necessitates a sturdy but beautiful driveway right from gate to garage door. A garden around the property must have sumptuous walkways to move across and reach to the swimming pool or patio places in between. Small to mid-sized properties looking for a decent patio to arrange a Quebec party. These all installations, patio, path, pool deck, and driveway need careful planning with the help of experts or experienced professionals. If you are capable of doing it yourself, here is a step-by-step guide to lay paving stones for multiple constructions to beautify your property with required synergy. Any construction needs engineering planning, and exterior designer can help you to create accurate drawings on engineering drawing papers with required measurements to work. Contractors or masons always demand such precise drawings before starting the work. If possible take help of any exterior designer or landscape architect to obtain professional drawings. If it is not possible, measure the entire landscape where you want to lay paving stones and fix everything on the drawing paper. Before starting anything, run an inquiry in the local utility body to assure what is laid beneath ground so you cannot hit a cable or supply/drainage pipe accidently. If anything buried, request them officially to remove it at the safe places. Number one -stones for paving. Number two – base material to lay the foundation on the land to give stability and strength. Number three-the sand to fill it in between the layers. Cement and concrete to fix the construction, and edge restraint to stabilize the stones in construction is mandatory before doing anything on the project. Cost-effective price required grades of quality material, and on-time delivery is concerns while finding the suppliers. The best thing is to get a reliable one in your vicinity. Go online and run a search, you will get everything about the suppliers like products, price, services, location, and reviews to check their credibility. If you live in the USA, I will recommend “World of Stones” at Maryland with several branches as the most dependable supplier for stone craft and a variety of paving and other materials at competitive market rates and with the highest quality. 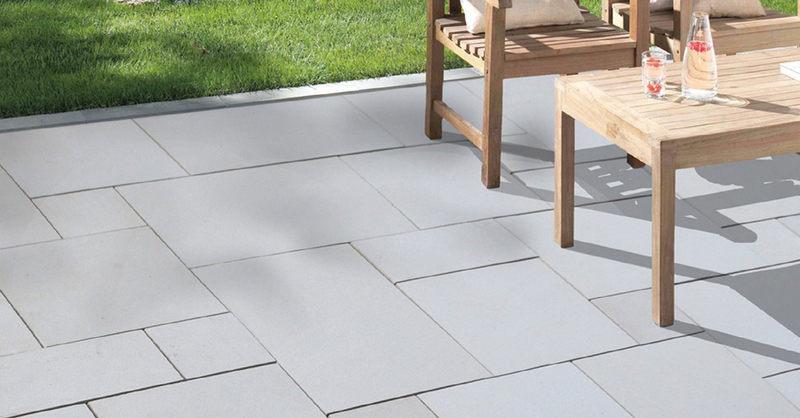 Once you find a right supplier like WOS consider a range of natural paving stones, such as Sandstone, Limestone, Flagstone, Bluestone, Slate Stone, Granite Stone, Cobblestone, Fieldstone, round stepping stones and stone bricks. I prefer a blog on natural stone patio pavers to read more, go through it. Leverage the free consulting services provided by the supplier you have selected to make the right decision for your paving stone needs. It is a simple thing if you are familiar with the term square foot. You can measure the length and width of the area to cover in paving in a unit of the foot. Now, multiply length with a width (LXW) and get the total square footage of your construction area. Now, obtain from your stone supplier the paver coverage rate, which is depending on the size and shape of paving stones. Take care to buy additional material up to 5-10% to fit the curves and odd spaces. If your area is in regular shape, it is easy to mark it by using rope, spikes, and lime/chalk powder. If it is in an irregular shape, you need to learn some trigonometry and calculate angles, curves, and sides applying engineering knowledge. For a big size project, the help of a civil engineer or experienced contractor is mandatory. Keep in mind that your exterior paving needs adequate drainage. A slope of 1/8” to ¼” is recommended in most conditions if it is a path/walkway or driveway, part the slop into two directions from the center line. For the patio, the one-sided slope is enough. Now, how will you fix the slope in the field? Take a stake and fix it at the high point of your imagined slope. Mark the correct required height (Suppose it is 12”) on the stake and tie a string around the stake at the marked point. Now take another stake and fix it at a linear point on the boundary exactly opposite to earlier stake. Calculate the slope (1/8” to ¼”) and lower down the mark on the stake at the boundary. So, it will 11” now if the distance is 8’ to 4’ accordingly. Similarly, create string cross-lines to cover left areas and assure correctness of slope. Repeat the process at a regular distance so you can cover the majority of stones beneath the ropes/strings. You have stakes with correct marks fixed on the surface of the land. Now, it is time to remove the strings/ropes to open up the area for digging the ground for installation. Now, how will you count the depth? For vehicle traffic count up to 12” depth of base depending on the sub-base material. For soft clay land, it is more profound than harder soil. Now, take the sum of the thickness of all layers and excavate the same depth following the marks you have made on stacks. You must measure the depth from the marks to assure the slope you have defined. Cover 6” to 12” space beyond boundaries for installation of edge restraints. 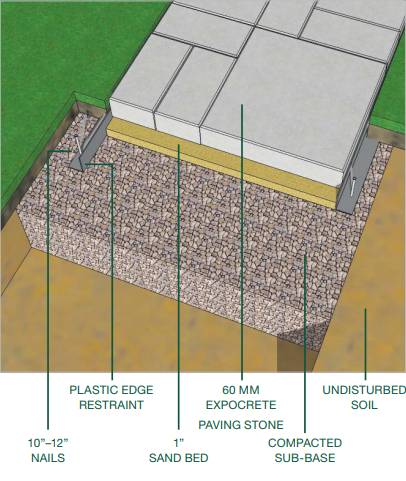 Edging will save materials and stones from scattering due to load/pressure. Level the surface of the bottom soil once you achieve desired depth to fill up the uneven Use the appropriate amount of water to wet the sub-soil and compact it with the compactor. You will find an overall picture as mentioned in the picture above. These properties of crushed stones make compacting process easy and load bearing. You can add 3/4 minus gravel in the mixture and wet the entire material a little bit to attain high compaction. Spread the base material in a layer of 6” thickness across the entire excavation area. Use hand tamper for smaller regions or mechanical plate compactor for larger areas. Add another layer and repeat the same process until to attain desired depth throughout the excavated areas based on marks on the corresponding stacks. Edge restrain holds the shape of the paving project is it a patio, path or driveway. Edge restrain available in plastic, metal, non-corrosive wood, or pre-cast concrete. Now, fix the edging using 10” to 12” nails into the ground and base materials and paving stones. If your design is in odd shapes, you have to cut edge restraints accordingly. Sand quality is essential for paving the stones. If sand particles are containing crushed rocks or any organic material, it may result in uneven seating of paver stones. After wetting and water percolation, organic matters whether swell or degrade and leave holes there. Select ASTM C33 and CSA A23.1. Otherwise, ASTM C-144 and CSA 179 graded mason’s sand is an alternative. You can apply screed rail to level the concrete and sand. It will help you to make the surfaces even. Pipes will help you to fragment the large spaces into smaller ones and fill the gaps beneath the pipes after removing it. Sometimes paving stones come into irregular shapes and need mason cutters specially made for stone cutting to get desired shapes according to your design. Today high-end stone cutting machines are available in the market using water jet along with diamond embedded edged cutters. Installation of paving stones on the sand layer is easy if you take enough care. Never stand up your feet on a sand layer or walk on it. It will disturb the evenness of the layers and create a lot of problems. Similarly, keep your foot away from the edges of stones and try to remain at the center to distribute your weight evenly on the stone. Place the first stone slab in position and use a rubber mallet to tap it down evenly. Now, use the plate compactor to tamp the pavers into the sand. Remember that it is essential to keep away direct contact of any mechanical compactor from surfaces of paving stones. Use wasted or empty gunny bags and layer on the top of the paving stones before placing any mechanical or even manual compactor. Apply it thrice to press stones into the sand snugly. Leave joint space of ½” between stone slabs to fill up with silica sands or polymeric sands. Some sand will come up during the compacting process and fill the gaps unevenly. Use brush and knife to press it and distribute evenly within the gap. Now, pour polymeric sand until you fill about half-full the gaps between the stones. It will keep paving stones from shifting as well as prevent intrusion of dirt particles and weed seed to sprout. These are nasty things and can spoil external paving due to weathering. For intenal flooring, use mortar to fill the gaps completely. Now, pour finer sand like bagged silica over the paving stones and brush it manually or use a large broom to distribute evenly on larger areas and completely fill the joints. It will lock the pavers. Afterward, spray a mild jet of water on the pavers and let it dry. Now, apply a suitable best sealant/sealing product on the pavers to give it durability and protecting from weed growth. Regular cleaning, sweeping, and power washing can save your paving stones from degradation process. Re-sealing with high-quality sealant also grant durability in appearance and save stone color, texture, and shining from fading fast. If you think doing these all daunting for you or out of your capacity, contact distributor of the “World of Stones” in your vicinity. It will help you to get the best paving stones, as well as indirect, helps to get right team of engineer, contractor, and masons in your region to obtain the best out of your investment. Thank you for pointing out that before you start paving anything you should make sure and have everything planned out. My husband and I want to get our deck repaved and need to find the best contractor to do it. I’ll have to do some research and find the best contractor possible. I like your advice to research the various suppliers online to learn about their services and compare them to find one that has a cost-effective offer for the quality you want. When researching them, it might be a good idea to read reviews as well as check out the websites for any companies you’re interested in so you can learn about the services and quality offered by the different stone and sand suppliers. While you do this, it might be a good idea to create a list of questions that you can ask them when you all the ones you’re interested in so you can see if they offer the type and amount you want and also talk to them about your project to get their input on whether you have the right material and amount you need for the stone paving you want. Thank you for these tips on getting your pavement done. My yard is needing a new patio and I want to find the best contractor to lay it for me. I’ll have to do some research and find the best contractor in my area. Bluestone Pavers – Why Popular Choice for Outdoor Paving?